Tip 1 - Treat your body like a house of worship … with respect. Tip 2 - Got health? Tip 3 - We do not have a health care crisis. Tip 4 - Being healthy is a revolutionary act. Tip 5 - Be an informed consumer. Have a healthy dose of skepticism. Tip 6 - Genes load the gun, but lifestyle pulls the trigger. Tip 7 - Are you on The Main Street Diet? Tip 8 - The American diet is the worst diet you can eat. Tip 9 - The Western diet can be funny. Tip 10 - Myth buster: If you eat a healthy diet, it's bland and boring. Tip 11 - Enjoy food. Tip 12 - Diets don't work, lifestyle changes do. Tip 13 - It’s not about willpower and deprivation. 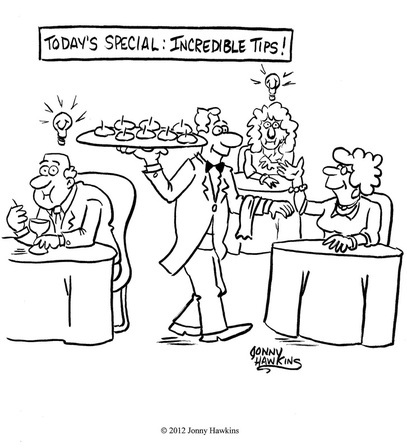 Tip 14 - Everything in moderation - a failing proposition. Tip 15 - Good habits are as addictive as bad habits and a lot more rewarding. Tip 16 - Make an appointment. Tip 17 - 150 is a magic number. Tip 18 - The weigh-in. Tip 19 - Know your Body Mass Index (BMI). Tip 20 - Losing weight and living a healthy lifestyle is not complex. Tip 21 - Get motivated. Tip 22 - Gobble up a lot of information. Tip 23 - Maintain a food and exercise journal. Tip 24 - Stay strong. Be Strong. Tip 25 - Embrace aging. Tip 26 - Love food, not nutrients. Tip 27 - Diet Dogma. Leaving the Circle of Disease. Tip 28 - High Satiety. Tip 29 - The missing ingredient. Tip 30 - Order a winning combo-platter. Tip 31 - Two magic nutrients. Tip 32 - Let's be best friends. Tip 33 - Can't get enough of your best friend. Tip 34 - Try it. You'll like it. Tip 35 - Veggies taste great. Tip 36 - Eat less meat. Tip 37 - Antibiotic factoid. Tip 39 - Get off the bandwagon. Tip 40 - Organic or bust. Tip 41 - Healthy, not expensive. Tip 42 - Fresh frozen. Tip 43 - Healthy recipes galore. Tip 44 - Eat more, not less. Tip 45 - Eat more frequently. Tip 46 - If you are hungry, eat. Tip 47 - Unhealthy snacking. Tip 48 - Bag the bag. Tip 49 - Sugar in unlikely places. Tip 50 - Know your food weaknesses. Tip 51 - Pack it! Tip 52 - Make your own healthy snacks. Tip 53 - Locate a bar. Tip 54 - Fruit is nature's candy. Tip 55 - Make fruit smoothies a part of your routine. Tip 56 - Go wild! Tip 57 - Grow a garden. Tip 58 - Eat with the seasons. Tip 59 - Step outside the grocery store. Tip 60 - Read the label. Tip 61 - Read the ingredients. Tip 62 - When zero is not zero. Tip 63 - Get out your calculator. Tip 64 - Ignore health claims. Tip 65 - Calories are important. Tip 66 - Calorie confusion. Tip 67 - Do not drink your calories. Tip 68 - Beware of health drinks. Tip 69 - Are you an elite athlete? Tip 70 - Kick the soda habit. Tip 71 - Drink water. Tip 72 - Chew slowly and with purpose. Tip 73 - Control thy portions. Tip 74 - Portion distortion. Tip 75 - Dining out? You have entered the danger zone. Tip 76 - It's party time. Tip 77 - The low-fat scam. Tip 78 - Practice the 5, 5, 5, 5 Plan. Tip 79 - Trite, but true: Exercise is important. Tip 80 - Hang ten. Tip 81 - Exercise is easy. Tip 82 - Cheap meds. Tip 83 - The magic pill. Tip 84 - Engage the funny bone. Tip 85 - Get Dense. Tip 86 - King Squat. Tip 87 - Meet the King of the exercise movement. Tip 88 - Listen to your body. Tip 89 - Be in the driver's seat. Tip 90 - This is a test. This is only a test. Tip 91 - Be a tortoise. Tip 92 - Being healthy is patriotic. Tip 93 - Do not get bogged down with minutia. Tip 94 - Have a plan. The 6-Ps Formula. Tip 95 - Enjoy nature. Get outside. Tip 96 - Identify expert advice. Find your mentors. Good information abounds. Tip 97 - Timeless advice. Tip 98 - Every day is training day. Tip 99 - A two-fer. Tip 100 - Laugh a lot. Tip 101 - We must apply.